Swavesey Community Choir was established in 2006 by Audrey Caldwell, Director of Music at Swavesey Village College. Its first project was a performance of Mozart’s Coronation Mass with the London Mozart Players, at part of the Orchestra in a Village project during the Cambridge Music Festival. Samuel Hudson directed the choir from 2009-2011, and Chris Jessop from 2011-2016. John Mullett has been our Music Director since 2016. John was a founder member of the choir and brings many years’ experience in choral direction and performance. Our repertoire ranges from the classical choral tradition, through the music of the shows, to arrangements of pop classics. Our concerts are community events featuring a mixture of choir singing, individual items and audience participation. 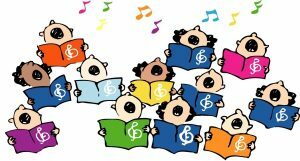 We are always looking for new members, young and old, to join our friendly community choir. There are no auditions so it doesn’t matter if you don’t read music, and you don’t even have to live in Swavesey! Enthusiasm and a willingness to learn are all that is required. Feel free to contact us if you are interested in joining.